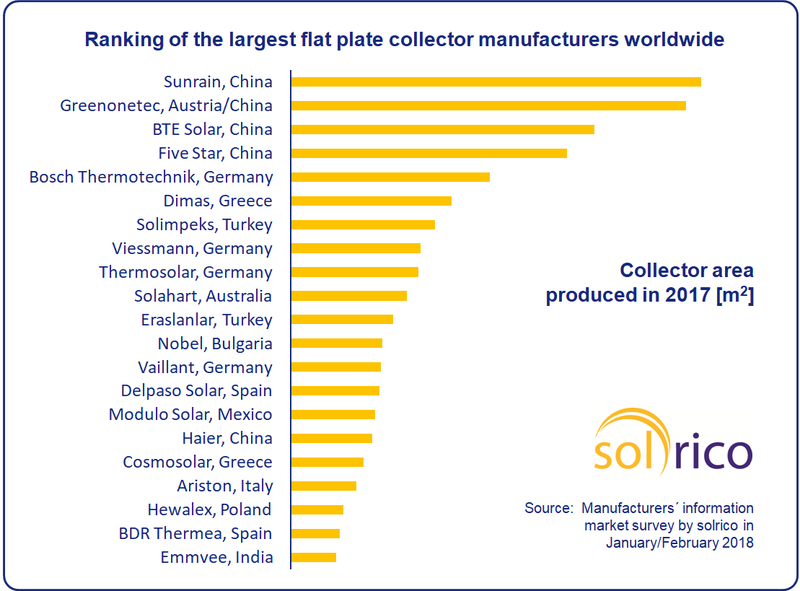 The annual ranking of the world's largest flat plate collector manufacturers is now published on solarthermalworld.org. It based on a survey among the largest industry players carried out by solrico agency. The 2017 ranking clearly shows the market dominance of Chinese companies. Even second-ranked Greenonetec, an Austrian collector manufacturer, is now majority-owned by the Chinese-based Haier Group. The corporation acquired 51 % of the manufacturer’s shares on 18 May 2017. The largest European flat plate collector producer was heating technology supplier Bosch Thermotechnik, although it remained at a certain distance from the top four. Business at Bosch Thermotechnik suffered from declining solar hot water markets in Germany (-16 %) and Brazil (-18 %). Nearly all the companies outside Germany increased production last year. For example, Greek OEM manufacturer Dimas Solar grew by 12 %, the reason being “new North African markets, where people are switching over from vacuum tubes to flat plate collectors, and the attractive thermosiphon support in Italy”. Delpaso Solar from Spain was “very satisfied” with the 11 % increase in collector area in 2017. It said that last year’s key driver was “export, with new markets and more countries.” Italian heating equipment manufacturer Ariston saw a 14 % jump, considering “thermosiphon system sales, especially in the Caribbean and the Middle East” to be the key reason for the growth in numbers. BDR Thermea, a Dutch-based supplier of heating systems, which has a collector production facility in Spain, was able to keep output at 2016 levels because of “novel drainback solutions for an increasing number of commercial projects.” Except for Ariston, all companies mentioned in this paragraph sell only flat plate and no vacuum tube collectors. In China, turnover varied significantly between companies. Some experienced strong growth, whereas others registered a downward trend on the market. BTE Solar announced the greatest surge in sales (+133 %), thanks to seriously tested systems produced on its new automated manufacturing line. The manufacturer said that those products “convince customers to return regularly.” Sunrise East Group with its brand Sunrain claimed to have increased flat plate collector output by 44 % in response to heightened solar water heater demand for property developments in southern China. However, the full-year financial results of the business, which is listed on the stock exchange, show a 15 % decline in solar thermal sales in 2017 due to a deep fall in vacuum tube collector sales according to the marketing department. Haier produced 20 % more flat plate collectors last year, also pointing to growing demand on the real estate market. Five Star saw a 13 % reduction in flat plate collector output. The company said that it had expected declining figures, since the entire market had been shrinking. Danish turnkey system supplier Arcon-Sunmark ended up at rock bottom, since it relies heavily on domestic solar district heating sales. The Danish market, however, has shown severe ups and downs in recent years. After a record 2016, which saw the installation of more than 400,000 m2 of large-scale collector fields across the country, Denmark was down to five, commissioned solar district heating systems and a total collector area of 26,536 m2 in 2017. Consequently, Arcon-Sunmark did not make it onto the ranking this year. While Hewalex, based in Poland, has likewise suffered a setback since the last ranking in 2015, it managed to stay on. It said that the key retarding factors were a lack of national subsidies, a decrease in fuel prices and increased competition from heat pumps. The chart above is based on a survey of manufacturers between January and February this year. The information collected from the questionnaires was compared with the results of the 2015 ranking and solrico’s long-standing annual industry surveys. Since some companies did not want to publicly share their total production output, a compromise was reached not to display figures along the horizontal axis. Even so, Soletrol from Brazil and Chromagen from Israel, two regular participants, decided in 2017, for the first time, not to provide any figures. The decision means that they were dropped from the list, although the 2015 ranking shows Soletrol and Chromagen high up, in 3rd and 6th place, respectively. German-based Wolf Heiztechnik did not make this year’s ranking because its level of production was too low. Wolf´s spot was taken by Emmvee Solar Systems, an Indian manufacturer which had been part of the ranking some years ago. India’s flat plate collector market recovered in 2017, after a long period of decline, primarily for two reasons. First, tenders in some states required a collector test certificate, which has only been available for flat plate collectors. Second, there is an ongoing debate about the substandard quality of certain imported vacuum tubes. 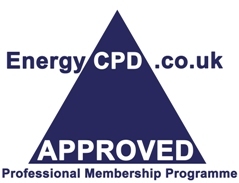 Thermosolar is headquartered in Germany, with a collector factoray in Slovakia. Cosmosolar from Greece was listed as having the same production output as in 2015. Technical issues prevented the manufacturer from sending the most recent 2017 figures.Bosch Thermotechnik, headquartered in Germany, owns additional collector production facilities in India, China and Brazil. In the first quarter of 2018, SMA Solar Technology AG (SMA/FWB: S92) sold inverters with a total output of around 1.8 GW and increased its sales in comparison to the first three months of the previous year by 5.4% to €182.5 million. The sales increase is attributable in particular to the positive development in the regions of Europe, the Middle East and Africa (EMEA) and Asia-Pacific (APAC).